Why racing? Isn't dangerous? Yes, it is. With good risk management, motorcycling is just about the most enjoyable and rewarding physical activity I have ever engaged in. "Risk Management" to me is the key. Almost any human activity can be dangerous - even life threatening. Let's start with what we eat, drink and smoke - all risk-filled and frequently uninformed choices. Then there is crossing the street, driving to work, working on a ladder - you get the idea. The more inured we are to our activities the less concious we are of risk. Although this is only anecdotal, I personally know more people who have been seriously injured riding bicycles, running, working on ladders, skiing or playing tennis, than injured while racing motorcycles. 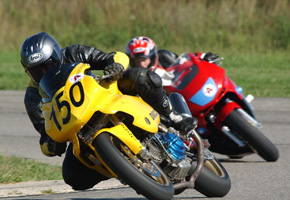 Risk management lessons from motorcycle roadracing (from here I'll just call it "racing") would be well applied to most physical activities. I consider a lot of variables before getting on the track. Like having your own machine prepared for safe racing operation. The twisted wires at left are safety wire applied to dozens of components to keep them from loosening = non-trivial prep time. What is the condition of the track, weather, etc. Have you walked every foot of the track to inspect the surface for irregularities, changes in surface prep, etc. 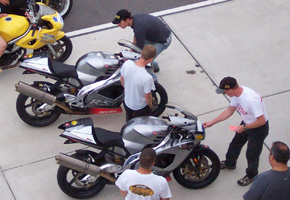 Race organizations and track day organizers conduct technical inpections before anyone gets onthe track. Inspectors look for contols working properly in their normal limits, damage to mechanicals and body work, and if racing, safety wire on all critical parts. Many organizations do a full inspection of all rider safety gear as well: from helmet to boots. If you go down during the race or a session (def: one hand grip touches the ground) you need to be tech'd again before allowed on the track. For me the most important risk management component is the community of people on the track. 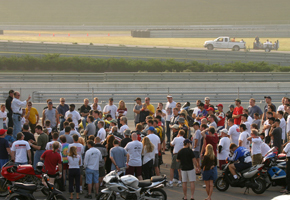 A good racing club or trackday organizer is building a community radically commited to everyone's safety. It's a meritocracy. First you must have certified training. And if you're riding isn't up to the group's saftey standards you are removed from the track. In some clubs, an on-track incident will get a rider banned for the weekend, or even permanently. Like any organzation, good practice begins at the heart of the group and with its leaders.